Location: Regional - USA only! The sign up dates are going to be quicker and the amount of partners as well. Anything! 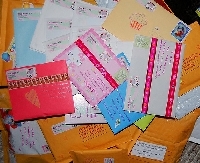 You can send something as little as a letter, or stickers to a package full of goodies. It can all be random, or it can be completely profile based. Just NO postcards. You can send an unused postcard in an envie though! Please don't send things that you wouldn't want to receive yourself. Because of the amount of partners, I'm going to be a little strict. At least a 4.8 with 15 completed snail mail swaps. Emails and postcards don't count, sorry. I'll be hosting more in the future and if you're a newbie, no worries, you can catch it at a later time. To my swappers:Only four days to get this together eight people. Please know that I am working on it and you will get yours but it may be a day or two late.